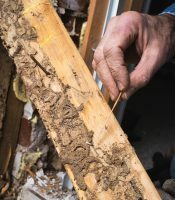 When you need termite damage repair in your home in Yorba Linda, California, it is important to hire experienced professionals to handle the job. Repairing termite damage is intricate work. When not performed properly, damage may simply be covered, and over time, this may put the structural integrity of your home at risk. However, when you turn to Kilter Termite and Pest Control, you can rest assured you’ll receive service from experts who will treat your project as if it’s being performed in their own homes. At Kilter, we take quality seriously, which is why we go the extra mile for our customers in Yorba Linda, CA. For example, we always use the correct type of wood in each application and only use construction-length boards to minimize unsightly seams. We also prime all of the wood we install to ensure it will hold strong, even in outdoor applications. And, we offer optional painting services to blend your wood replacement with the surrounding areas of your home. If you are interested in learning more about the termite damage repair services that Kilter Termite and Pest Control offers in Yorba Linda, CA, contact us today. Also, if you’re still dealing with a termite infestation, ask about our specialized treatment plans, which are more effective and convenient than most alternatives.